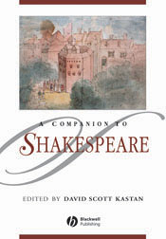 A Companion to Shakespeare is an indispensable book for students and teachers of Shakespeare, indeed for anyone with an interest in his plays. Contains 28 newly commissioned essays written by the most distinguished historians and literary scholars. Situates Shakespeare in the historical and cultural conditions in which he wrote.